The design for this pall, which I’ve embroidered several times, has always been a favorite. I’ve had lots of requests for a copy of it, so finally I managed to drum up a tracing. I’ll share it here, with some ideas on different ways to stitch it. In an earlier post on this embroidery design, I discussed the stitch choices I used when I embroidered it the first time. I had a problem with getting the grapes right, and had to re-do them, but in the end, the pall came out well. The photos from that project are pretty lousy, though – I’ve learned a lot about photographing whitework since then! 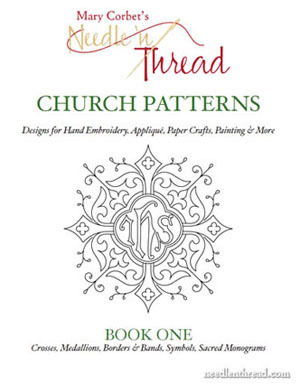 The design is taken originally from Lucy Mackrille’s book on Church Embroidery & Church Vestments, which anyone interested in ecclesiastical needlework should have in their library. Fortunately, you can find the book online for free. If you visit that link, it’ll take you to my review of the book, where you’ll find further links to the book in four parts, each part a separate PDF file. The only differences in the stitching would be that the outlines in the above image were most likely done in overcast stitch, which would increase the stitching time quite a bit. I used a whipped backstitch on mine, stitching very small, even backstitches, and then whipping each backstitch to make a distinct line that sits up above the fabric (like an overcast line would), but without requiring the same amount of time for stitching! 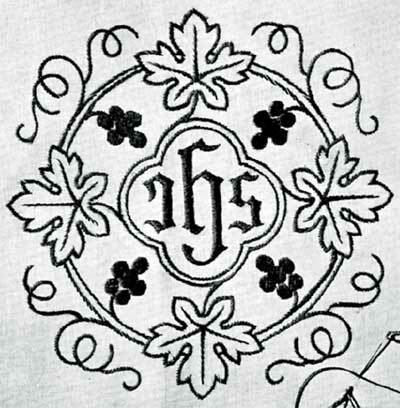 I didn’t pad the grapes, as the embroiderer did in the image above. In one version of this design that I stitched, I satin stitched the central lettering, which gave a bit of continuity between the lettering and the satin stitched grapes. There’s lots of room here for different interpretations of the pattern! 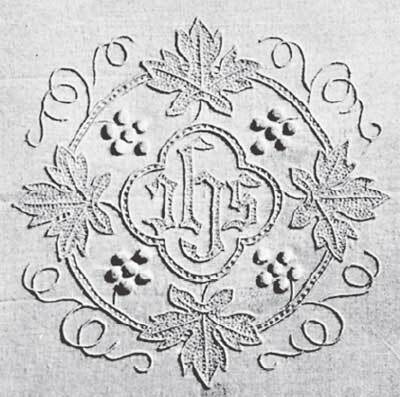 The book is in black and white, but the text explains that this pall was embroidered on white linen, using red cotton thread, and mostly stem stitch, with the exception of the satin stitched grapes and the satin stitched central letters. I actually want to try this – a red on white version of the design. I think I would probably use silk (I’m thinking about Soie de Paris, actually). I love the way the stem stitching in the tendrils on the corners expands and contracts around the curves – very pretty effect! I’ll have a post up later this week on how that is done. I love this pattern. Thanks for sharing! Glad you like it, Angie!! We have several palls in this pattern at church. They are all white on white and very old. The inside boards have poked through the corners and each has become soiled on the edges. I am slowly replacing them with new palls. Some of the old ones were stitched on old pillow case fabric (there are remnants of stamped patterns inside). What fabric do you typically use for palls? I just love this! I may go ahead and make one, even though I am only faintly affiliated with one of the local Catholic churches. It just looks like it would be so very enjoyable to make. I take it you wash the linen before stitching? But then, does linen shrink the same way cotton does? Does anyone make these out of cotton or are they always linen? So can you tell us what happened to the gold embroidered pall that you made? Or am I asking an embarrassing question? I realize there are lots of questions in this comment, but I am curious! It shows I’m paying attention, something a teacher should always appreciate. HI, Cynthia – yes, sometimes they’re made on cotton. Um. Well. They can be made on cotton. Rubrics generally call for linen, but people pretty much do what they want these days. Linen does shrink – not by inches and yards, of course, but it does definitely shrink. I usually pre-shrink mine. But some people prefer not to. I just like to know exackitackily what size I’m working with, so I don’t have any surprises when it comes to making the thing up. Oh. The gold pall. That. Well. The design is so beautiful. A friend of mine does church embroidery and I am going to mail this to her. Thank you. This would be gorgeous on the skirt of a christening gown. Previous Previous post: Marbleized Fabric & Embroidery: Do they Mix?